The establishment of color standards for content creators and print service providers is among the most important industry achievements of the past two decades. Prior to the establishment G7 color for proofing and press matching, customers and printers alike were left to find their own unique and often expensive work-arounds to achieve acceptable color reproduction. In a nutshell, G7 color management is a standard approach that creative, prepress and printing professionals can follow to achieve predictable color. The G7 standard ensures similar appearance of color from proof to print on different substrates and/or paper stocks and across different printing methods and/or printing machinery. The way the G7 system works is that service providers submit to an audit of their processes at a specific location or production facility to ensure that they are G7 Master Qualified. This means that the staff and equipment in the facility are capable of producing proofs and printed products within the parameters of the G7 standard. G7 Grayscale: This is the basic level of qualification. It signifies that the printing system is stable and that measuring equipment is employed to keep the press in alignment with G7 ideal color. This ideal color is based on matching a G7 process color grayscale tone curve. G7 Targeted: This intermediate level signifies that the above grayscale matching is in place plus the facility is able to maintain solid ink density targets in the cyan, magenta and yellow. It also means that the facility can achieve a higher level of matching to reds, greens and blues from proof to press. G7 Colorspace: This is the most stringent level of qualification and it signifies that the facility is capable of grayscale, solid ink density target and matching to a specific color standard (known as a Reference Print Condition) such as SWOP for web offset publications on a #5 coated groundwood or GRACoL for sheetfed printing on the highest quality coated #1 grade sheets. What does this mean for buyers of print media? Some of the details of G7 are admittedly very technical and difficult to explain. 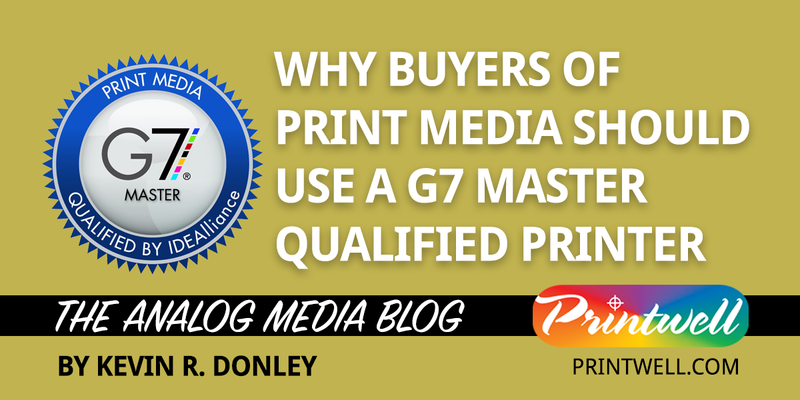 However, what all of this means from a business perspective is that buyers of print media should select G7 Master Qualified suppliers to get the best value solutions: the highest quality color reproduction that is consistent and repeatable across all print media needs. G7 Master Qualified suppliers have invested in the equipment, staff training and audit process and are committed to ensuring that customers achieve the closest possible match to desired color that is available. Marketing departments that are focused on corporate identity can ensure that the color of logos and other branding elements are consistently presented to customers and the public. Publishers achieve consistent and high-quality photographic reproduction as well as industry-standard color for their advertising customers. Designers are able to get repeatable, high quality reproduction of solid, flat and saturated color graphics as well as balanced photographic images. At Printwell, we are committed to high quality print production processes and we are G7 Master Qualified at the most stringent tier, G7 Colorspace. If you would like to learn more about G7 color management, please contact your account representative for a consultation or send us a message here and someone from our sales team will get in touch with you.